Our online store will close its doors tomorrow. This is necessary so that we can ensure you receive your ordered your tickets etc. in time for the event. So, you only have until tomorrow to secure your order, and to benefit from advance booking prices. At the event itself we will only be offering left-over stock and returned items. Information for our bloggers and podcasters: On the Saturday of the event we are planning to hold a press conference at 11:30hrs. Should you wish to attend the press conference, please contact our press coordinator, Janine. 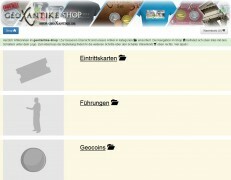 You can reach her via email at Presse@GeoXantike.de. Attendance at the press conference is restricted to those who have contacted Janine beforehand. For further information, just send Janine an email!